Today marks 3 years of blogging. Wow! How did that happen? I'm really not so sure. The Ginger Snap Girl started with a post called Mysterious Meringues on March 26, 2010. That title makes me laugh a little, by the way. I uploaded my first post with a less than flattering picture of vanilla and chocolate meringues and no recipe. It didn't even have a link to a recipe. Which I'm fairly certain is because at that point I couldn't figure out how to link to another website. In fact it's a wonder I got the picture in there. I started this blog based on a spark that was ignited when I discovered a whole world of delicious, enticing, inspiring food blogs that I didn't even know existed. I've said this before, but I honestly felt like I was a kid in a candy store. Obviously this girl loves candy since I'm still going 3 years later. Trying to contribute a little something to the food blogging world and continually being motivated and inspired by a number of talented bloggers sharing stories, recipes, drool-worthy photos and a little piece of their lives. I will say that I'm a really good project starter, however, often not a project finisher. So the fact this endeavor is still very much in flight, is pretty cool. As I reflected back over the past year I remembered that I actually set a few blogging goals last year at this time. In cyber print. For you all to see and for me to be accountable for. Let's see how I fared. 1. The Ginger Snap Girl has moved to her own domain name (already purchased...just need to make the leap) - Still own the name, didn't make the move. 2. GSG has gotten a little makeover (nothing drastic like a face lift...but maybe a little boxtox here and there) - No signs of any face lifting just yet. 3. I've challenged myself to be a better photographer and storyteller - Definitely made some progress in the photography department. I have a better handle on how to actually use my camera's manual settings as well as learned some new editing techniques in Light Room. Still work to do though. No progress on the storytelling aspect. 4. I've lost 5 pounds and my skinny jeans fit again - Okay this really wasn't a "blog" goal. Or perhaps it was a subconscious one trying to tell me to post more healthy recipes and fewer dessert recipes. This goal has not be achieved in the conscious or subconscious world. 5. I'm developing more and more of my own recipes - Very minimal progress here. I had 6 original recipes of the 56 I posted in the last year. Lots more work to do here! I'm kinda of bummed that I didn't reach all my goals. I mean I just got through telling you how I start projects and don't always finish them and here I am not finishing stuff. But guess what? This blog is a work in progress and apparently so are certain goals. So here's to the next year and achieving the previous goals as well as developing some new ones. Thanks for sticking with me on this blog journey! I'm sure you want to get to the really important stuff now--the cake! I'm a firm believer that birthdays (and anniversaries) should be commemorated with cake. I saw this recipe posted recently on one of my most favorite blogs, Tracey's Culinary Adventures. I knew it had to be made. I've actually never made a bundt cake (I don't count the baby bundts I posted recently...those are more like little donuts). I have 2 bundt pans...a full size and smaller one about half the size of a normal pan. It was finally time to break one of them in. I went with the half size bundt since Hubs and I couldn't possibly eat a full one on our own. 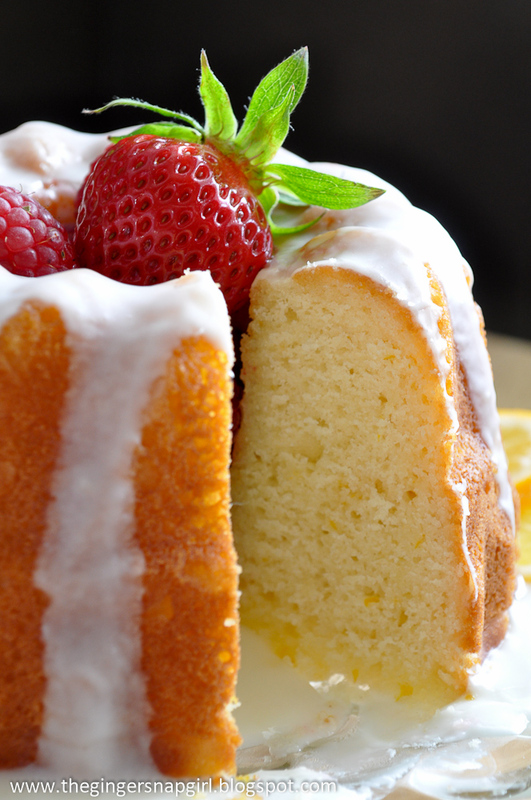 I love how pretty a bundt cake looks. The cake was best on the first day. On the second and third days it was a tad on the dry side, however a 15 second turn in the microwave brought it right back to life. Plus, who doesn't love warm cake? Preheat oven to 350 F. Spray a 12 cup bundt pan with cooking spray with flour. In a medium bowl whisk together flour, baking powder, salt and baking soda. 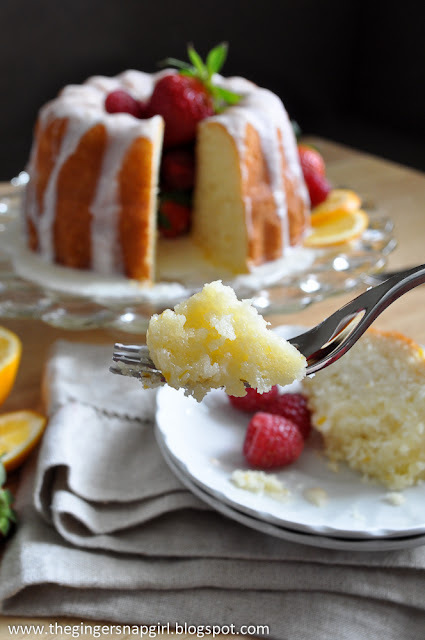 In a stand mixer fitted with the paddle attachment add sugar and lemon zest. Using your hands, mix the sugar and zest until the zest becomes fragrant and even distributed through the sugar. Add the butter and mix on medium until light and fluffy, about 3-4 minutes. Add in lemon juice and lemon extract and mix. With mixer on low add eggs one at a time, beating well after each egg. Alternate adding flour mixture in three parts and buttermilk in two parts, starting and ending with the flour mixture until batter is just combined. Pour batter into prepared pan and smooth the top. Bake on the middle rack for about 45 minutes or until a toothpick comes out clean. Cool pan on a wire rack for 10 minutes and turn out the cake. Allow to cool completely before glazing. Mix all ingredients in a medium bowl. Adjust lemon juice to achieve a thinner or thicker consistency depending on your preference. Pour glaze over the cooled cake. Notes: I cut the recipe in half baked it in a 6 cup bundt pan. You can substitute regular lemon for Meyer lemons. 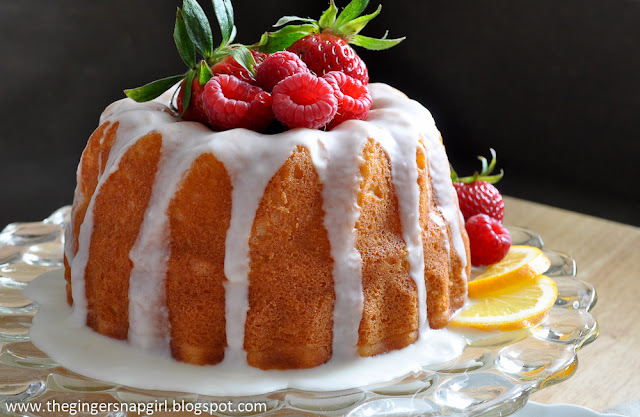 Looks yummy--what a beautiful cake to say happy blogversary! I do love your blog I always come away inspired. I like how you bake for the troops and spend time with your grandmother making candy and cookies. What fun traditions. Keep up the great work! We love you. Thanks Veronica! Maintaining weight is not an easy thing, especially being a food blogger. The sacrifices we make for our craft! A few years ago, not long after I started blogging, my Hubby and I lost 30 pounds each. That has been a big motivation in helping me to not gain too much back. That and small portions of the decadent things I love. Cause we all know I ain't giving up dessert! Blogging for three years is a goal and an achievement. Congrats! The cake is perfect to celebrate! Blogger now makes it very easy to change to your own domain and remain on their platform. !! H A P P Y * * A N N I V E R S A R Y !! Gratz BF on year # 3. Despite having not met these other goals you mentioned, you have done remarkably well and have achieved growth on your blog in lots of ways which is clearly evident if you compare then and now. And despite your best intentions, you are quite a busy lady and do so much for other people (like OBG)...so give yourself a pat on the back. You have achieved much and lots of time before you to continue to do more. Thank you mama! I have a big huge smile on my face. LOVE YOU! Awww happy three years Gloria! I always love when one of your posts pops up in my GR, keep up the good work! Also, your photography has evolved so much, it's just stunning my friend! As for the weight thing, it's a never-ending battle as a food blogger isn't it? For the past month I've been trying to lose some of the weight I've gained writing my blog. Thank you for the kind words, I'm so glad you liked the cake :) I agree - it did dry out a little on subsequent days, thank goodness for the microwave! The cake was great! It's seriously been my breakfast for at least 3 days. Dessert for breakfast is the best! Lovely cake and congrats on your 3 years of blogging! Congratulations on your third anniversary! 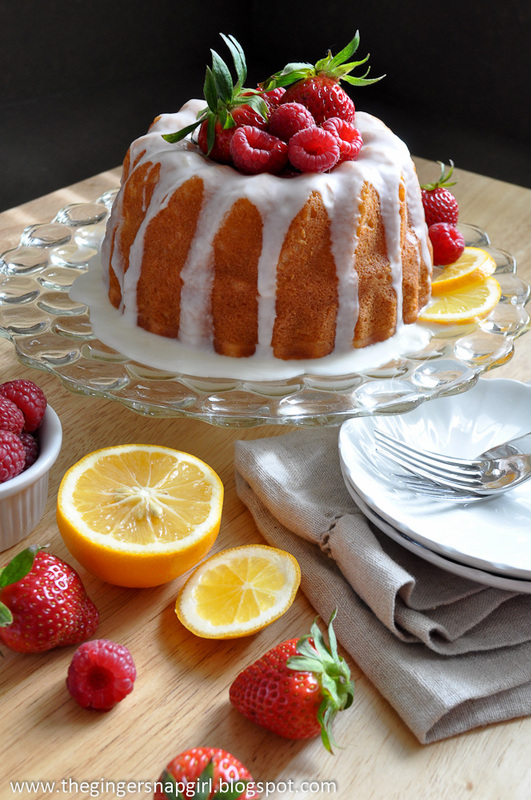 Your cake is beautiful, and I love the combination of the sweet meyer lemon with the tang of buttermilk. I have a sherbert recipe that calls for buttermilk, and My Honey is weirded out about it I think. I was wondering if I'd be able to throw some frozen wild blueberries in? And just one more question, if I'm using a scale, how does that change the recipe? I haven't checked how accurate my measuring cups are. As far as weight measurements go, I haven't done the conversion. I'm sure you can find some conversion resources online though. Good luck! This simply beautiful! I can see how lovely and delicious this is - buttermilk is a wonder!! Congrats on your 3 years :)) Time flies when you're having fun! 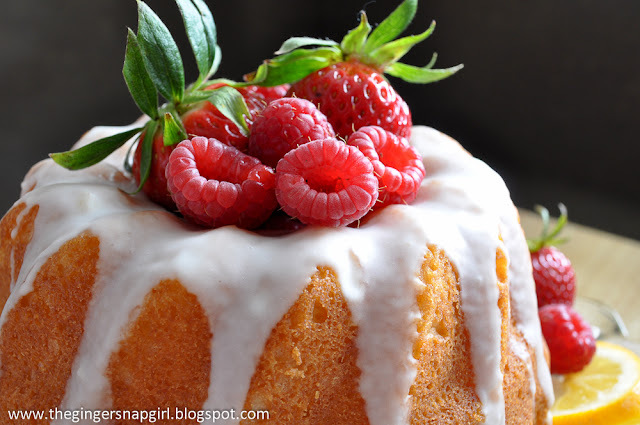 Happy 3 years of blogging, your cake looks beautiful! Ahh, goals shmoals :) Congrats to you and keep on rolling. 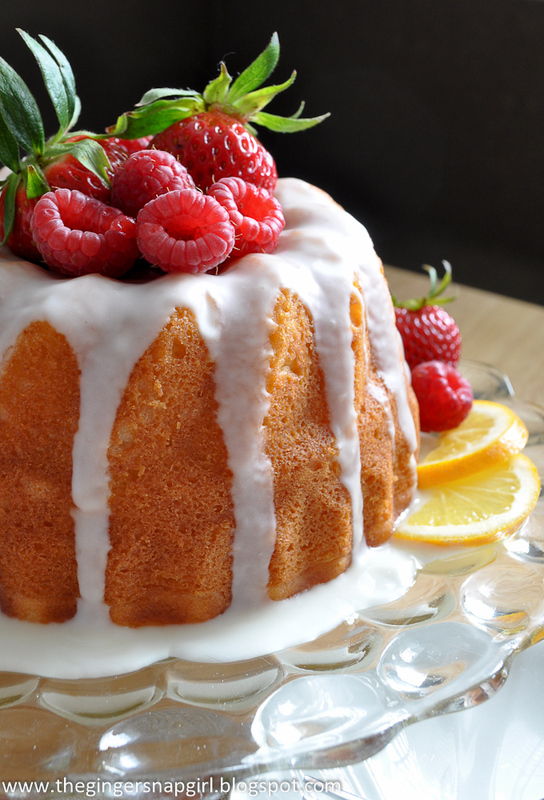 This cake looks perfect! That cake looks like perfection. Congrats on three years!